MOKUBANA allows anyone to instantly create an ikebana arrangement. Ikebana, the Japanese art of flower arranging, is a tradition that has been practiced for over 600 years. The art has evolved from simple floral offerings placed on alters into arrangements that decorate the spaces where people live, work, and play. MOKUBANA is a unique vase that allows anyone to create a simple arrangement with the addition of a few flowers. 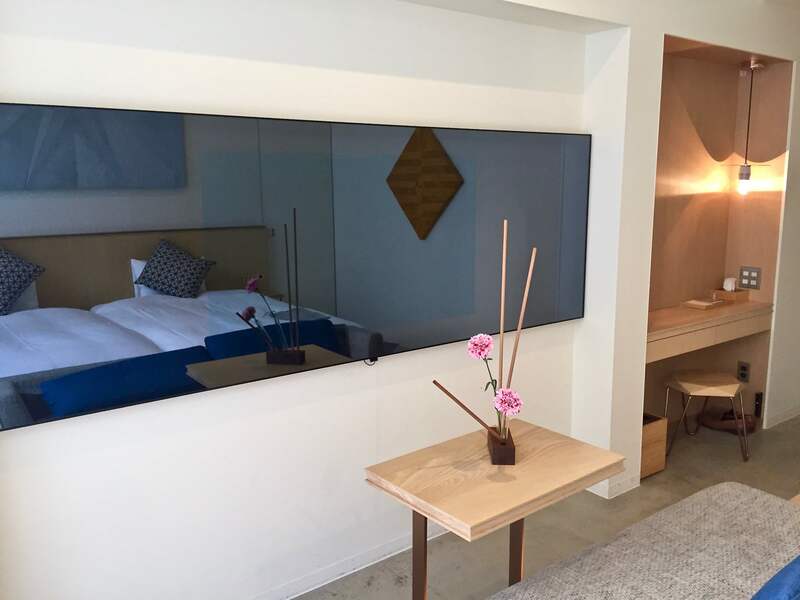 The use of wood and glass gives not only a natural feeling to the arrangement, but also creates a modern piece of art. The length, angle, and insertion points of the wooden rods, along with the angles and insertion points of the glass tubes, are part of the design of the simple wood base. Adding flowers to the glass tubes instantly creates a perfect ikebana arrangement. 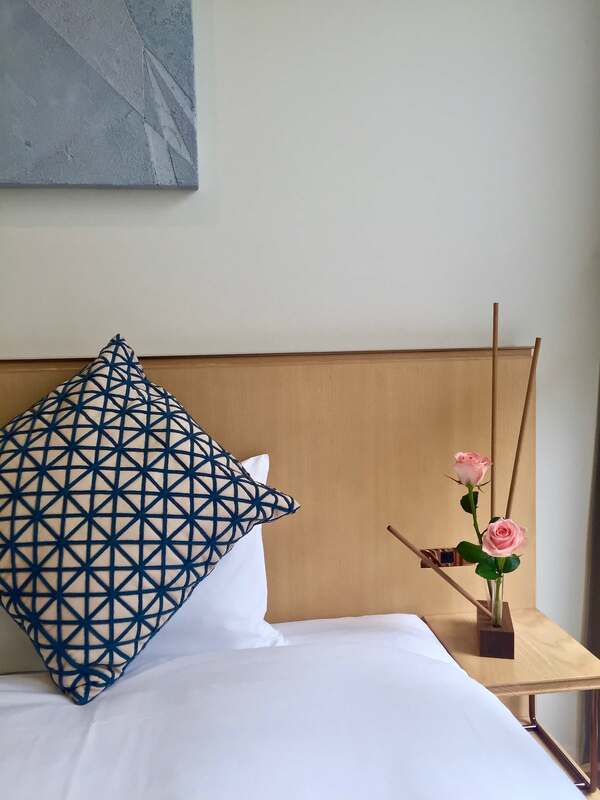 MOKUBANA is a combination of the words MOKU 木, meaning wood, and BANA花, meaning flower. It is also a play on the word IKEBANA. MOKUBANA is a unique vase that allows anyone to create an ikebana arrangement with the addition of two flowers. The use of wood and glass gives a natural feeling and also creates a modern piece of art. The length, angle, and insertion points of the wooden rods and glass tubes are part of the design of the simple wood base. Adding 2 flowers to the glass tubes instantly creates a perfect arrangement. The type of flower used creates different feelings making it suitable for a variety of interiors. 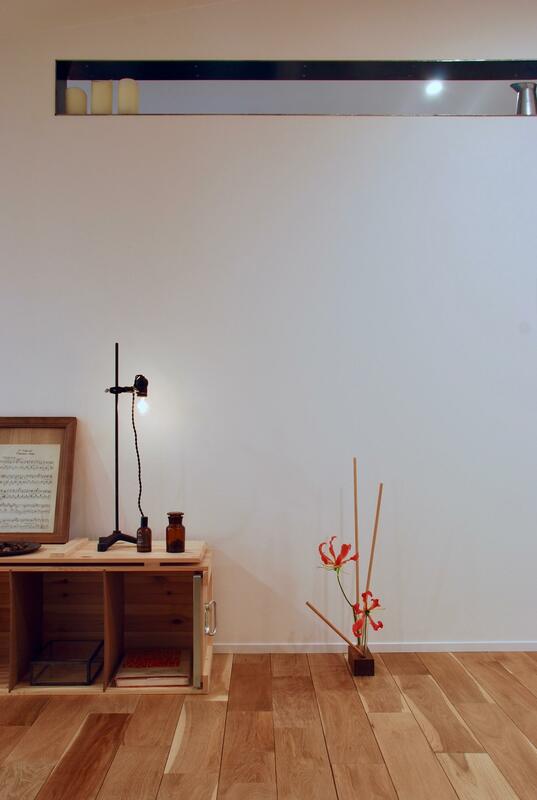 MOKUBANA brings the ancient art of ikebana into the modern spaces where people live, work, and play. 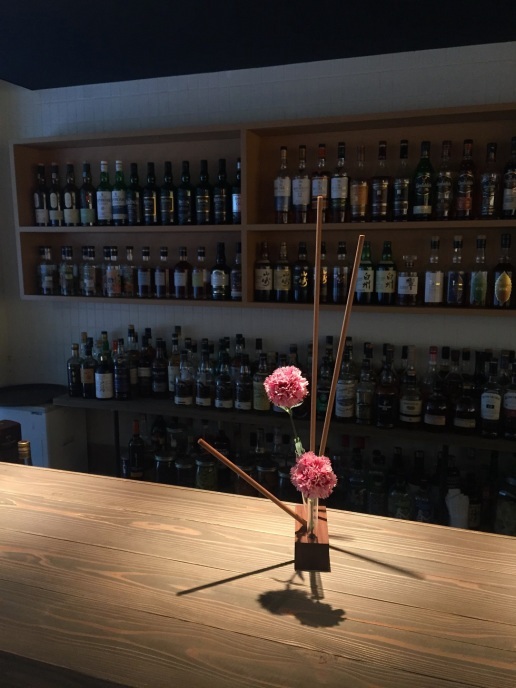 Ikebana is a tradition that has been practiced for over 600 years. To become a master of the art takes years of studied practice. 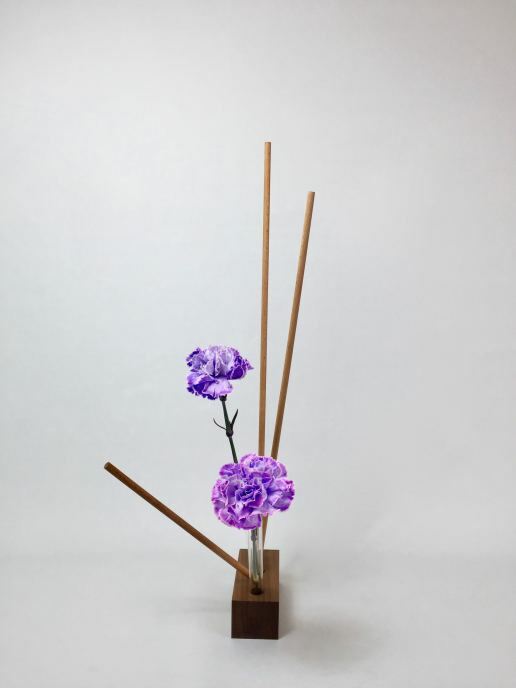 MOKUBANA allows anyone to instantly become a master and create a perfect ikebana arrangement with the addition of 2 flowers. 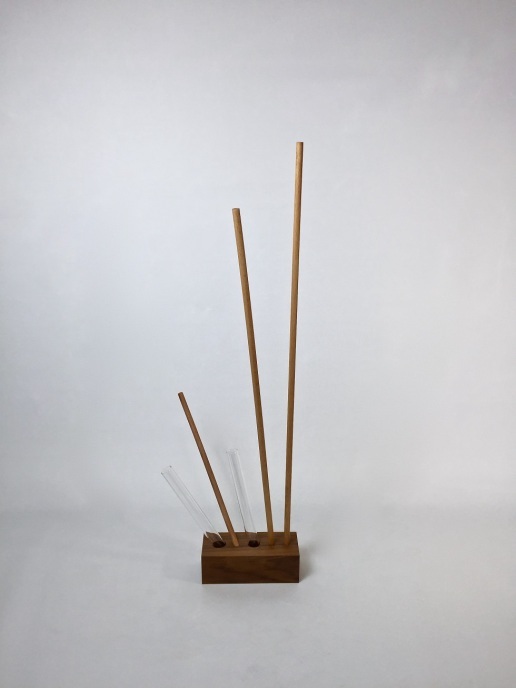 The walnut wood base is designed with holes at specific angles for wooden rods (with predetermined lengths) and glass tubes to hold the flowers, creating the perfect placement and giving the arrangement depth. 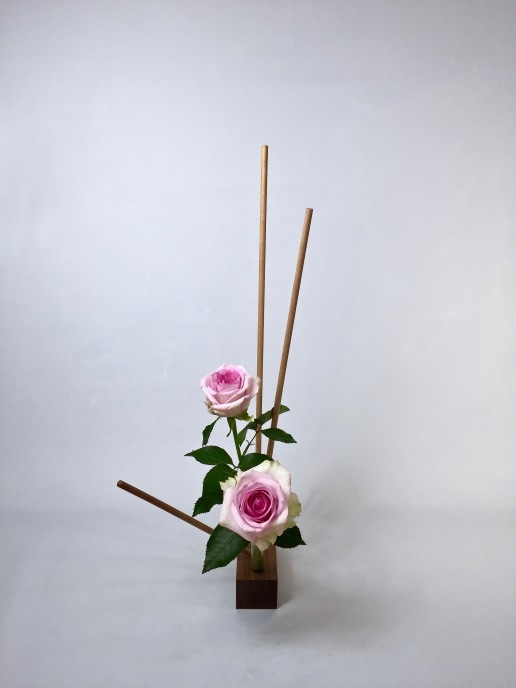 The angles also create an asymmetrical design, which is typical of ikebana. One flower is cut to 20cm, and the other to 30cm. Adding these 2 stems creates a perfectly balanced ikebana arrangement. It can be viewed from 360 degrees and creates interest from all angles. 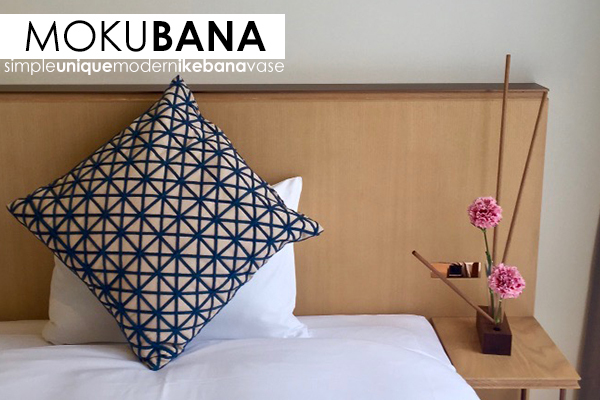 MOKUBANA is made with Japanese craftsmanship in Iwate. There are many types of vases made from many different materials. You simply add flowers to the vase to create an arrangement, letting anyone easily create something beautiful. 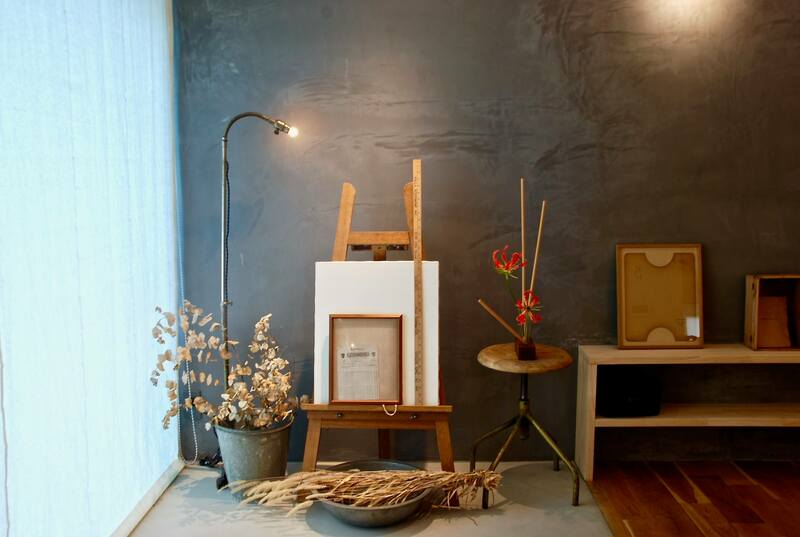 Ikebana uses specific rules for balance and simplicity of form which takes years of practice to master. There are many people around the world who love ikebana but are not able to study the art because there are no teachers near them. 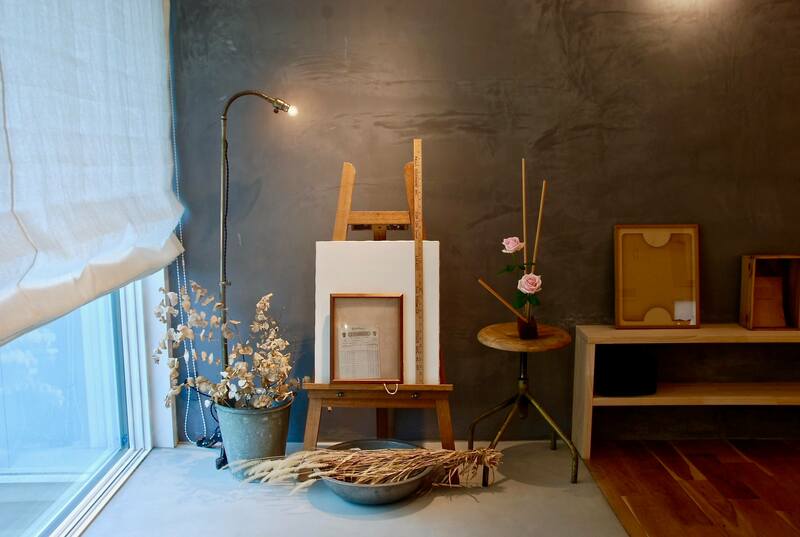 I wanted to allow anyone to enjoy the beauty of ikebana, even without having studied it. There are no vases that allow someone to easily create a balanced ikebana arrangement without ever having studied ikebana. 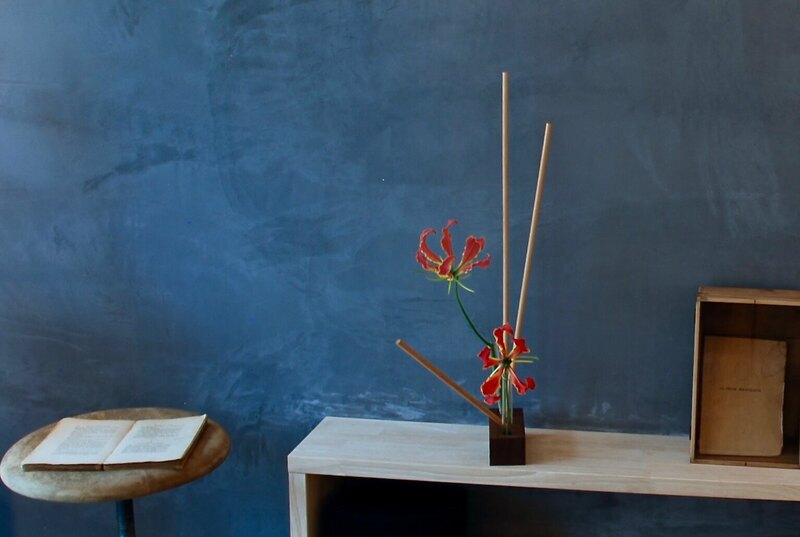 MOKUBANA was designed to allow anyone to create a simple ikebana arrangement with the addition of 2 flowers. It can be mastered by anyone within minutes and is simple and beautiful. 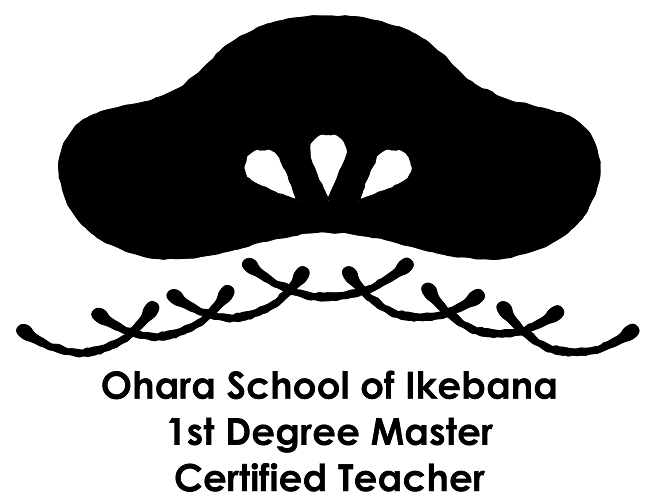 Stephen Coler, a Sub-Grand Master of the Ohara School of Ikebana, has been practicing ikebana for 20 years. Unfortunately, it is a dying art that is loosing interest among people. 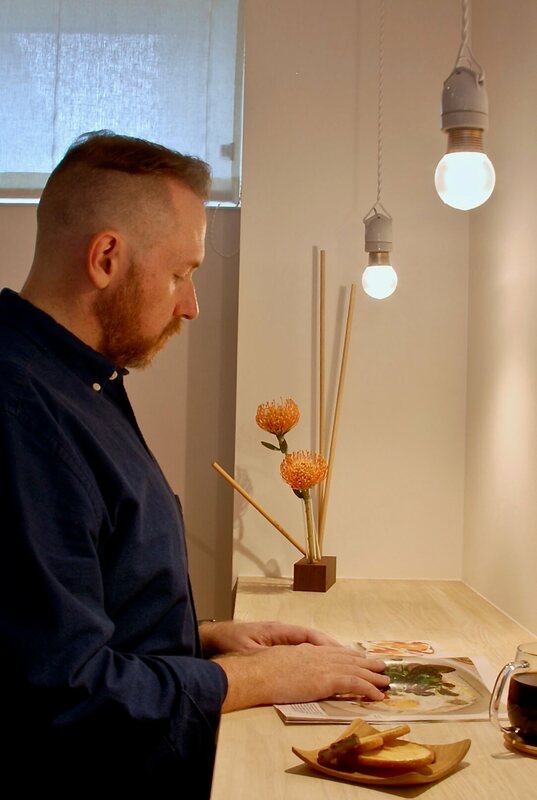 Stephen loves ikebana and wanted to create something that would spark an interest in ikebana and allow anyone, anywhere, to simply and easily create an arrangement. After several months and several prototypes, MOKUBANA was created. 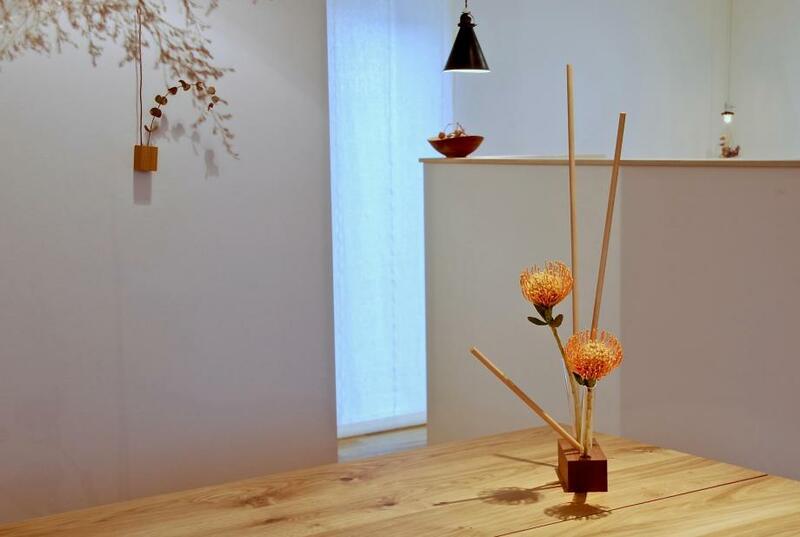 Using natural materials like wood and glass keeps in harmony with ikebana, expanding the overall beauty. 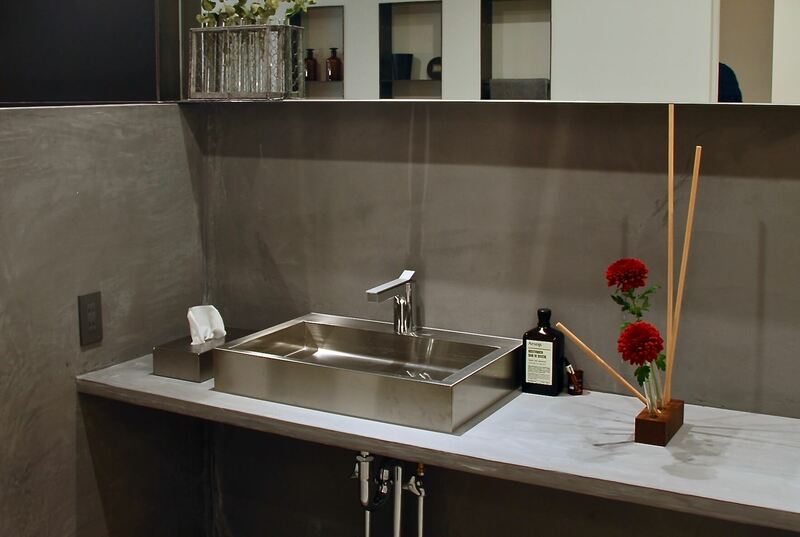 The natural elements also fit well into both traditional or modern interiors, making it ideal for any space. The use of different flowers and colors of flowers changes the feel of the arrangement, creating a new work each time. 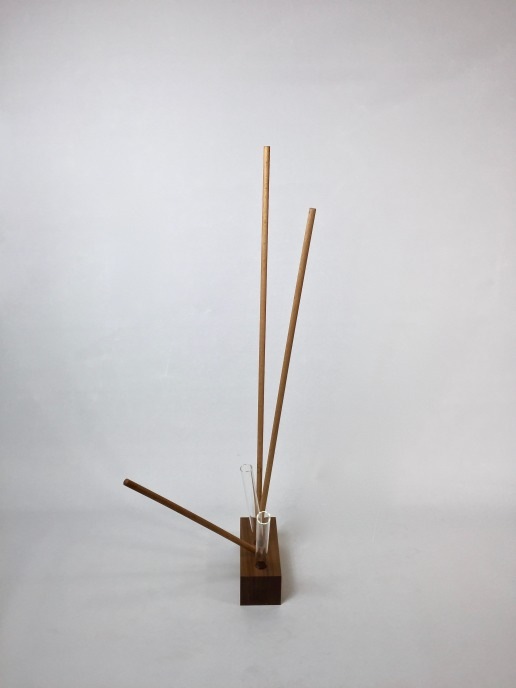 Even without flowers, the angles and placements of the wooden rods and glass tubes create a simple modern piece of art for the home. 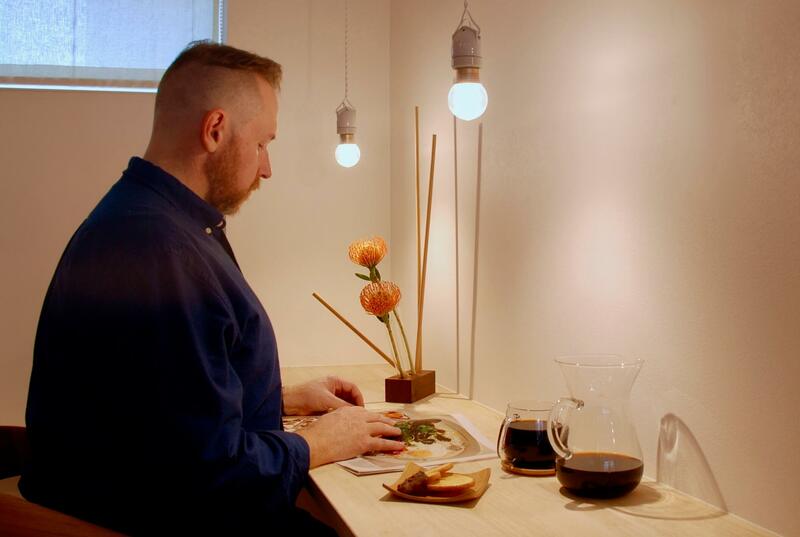 MOKUBANA is a simple, unique, and modern ikebana vase for the spaces where people live, work, and play. 1. Insert the wooden rods into the base.